CHAUVIN ARNOUX, the European leader specialized in portable Test and Measurement instruments. In 1893 Raphael CHAUVIN and René ARNOUX joined together to found CHAUVIN ARNOUX. 120 years later, the adventure continues and the firm is now the parent company of the CHAUVIN ARNOUX Group, specialized in the measurement of electrical and physical quantities. Electricity is a crucial type of energy at the heart of our daily lives. It has to be deployed and distributed while guaranteeing user safety and its consumption has to be controlled with regard to costs and environmental concerns. Designing, manufacturing and commercializing measuring instruments has been our core business for more than a century, allowing professionals to check and test the reliability, safety and efficiency of electrical distribution systems and the equipment connected to them, on a daily basis. Proud of our two brands, CHAUVIN ARNOUX® and Metrix®, we propose a wide range of measuring instruments used by millions of professionals every day, all over the world. 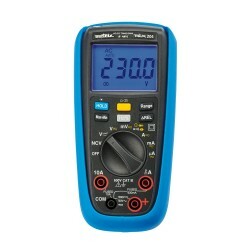 Our offering covers the fields of general electrical measurement (testers, multimeters and current clamps), electrical safety testers, wattmeters and electrical network quality analysers, oscilloscopes and, more generally, instruments for testing electronic devices and measurement of physical parameters. Our R&D teams (2 laboratories in France and 3 spread worldwide) imagine and create the innovative, long-lasting instruments which have forged the reputation of our brands. Although its historical base is in France, CHAUVIN ARNOUX is now present worldwide, either via its subsidiaries (USA, Italy, China, UK, Sweden, Germany, Austria, Spain, Lebanon, Switzerland) or, in the other countries, via its export sales department which is backed by a vast network of specialized distributors. Drawing on their expertise, our sales teams and our partner distributors do their utmost to provide you with the necessary support to choose the right products for your needs. CHAUVIN ARNOUX's industrial policy is based on its three production sites in France for the manufacture of the sub-assemblies and products for the CHAUVIN ARNOUX® and METRIX® brands. A factory in the United States and another in China provide local customization and supply additional products for our range. In accordance with the Group's quality policy, CHAUVIN ARNOUX provides its customers with products which meet its commitments and comply with both the national and international standards, particularly in terms of safety, metrology and protection of the environment. This approach is formalized by ISO 9001 and ISO 14001 certifications.